The Nex mall is the biggest mall near our home, and we often go there for a movie. But I don't fancy the restaurants in Nex, so we seldom have our meals there. There is something I really like to eat from Nex though, and that's the Dorayaki from Fiesta, located at B1 (Shokutsu 10). 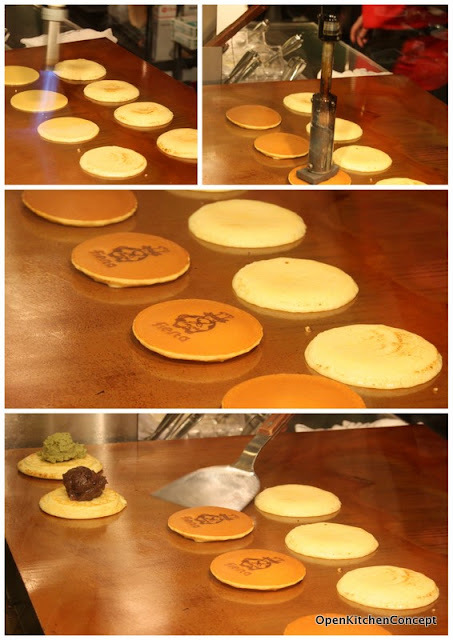 Dorayaki (銅鑼焼き) is a kind of Japanese confectionery. It's the favourite snack of Doraemon, the robot cat from the future. Dorayaki is made up of 2 sweet pancakes with a generous dollop of filling. The traditional filling is red bean paste, although you can find easily find other fillings like cheese and chocolate in dorayaki today. 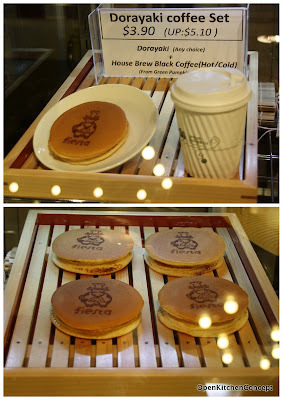 At the Fiesta stall at Nex, they make the dorayaki on the spot, after you order. First, the pancakes are cooked on one side. Then, they are flipped over and then stamped with the Fiesta logo. Lastly, the filling was added to the centre of one of the pancakes and the the 2 slices of pancakes were sandwiched together. The freshly made dorayaki is delicious - fragrant and hot on the outside, with cold filling. I like the red bean paste filling and green tea cream filling. Looks yummy. Can just imagine what one of those yakis with green tea cream will be like. Sounds so healthy. Btw, I loved doraemon when I was a kid. Those look warm and good!! I love Dorayaki too! I saw the recipe in someone's blog the other day!